Appearance: Ramm stands at 5’9” and weighs 165 lbs. He has a toned, somewhat musuclar build, and has lightly tanned skin, along with short, dark brown hair. Ramm has a beetle horn that protrudes from middle of his face--above the bridge of his nose--and curves 4 inches upward, and flattens out at the top. He also has chitin nails on his fingers and feet, which can help in combat, but very hard to cut off with regular nail clippers. Ramm has a scar on his chest due to a near fatal encounter with a Beringel. When not in his school uniform or combat gear, Ramm wears a earthy red and white button up flannel over a black v-neck shirt, along with blue jeans and pink orange tennis shoes. When on a mission, Ramm will wear a black and white jumpsuit under pieces of steel plate armor, which has some earthy red engravings on it. Ramm was born on the continent of Menagerie, in a long house near the main city of Kuo Kuana, to a loving lizard faunus mother. Unfortunately, Ramm’s father lost his life defending the city from a Grimm attack, leaving behind a small fortune and his sword, which Ramm would inherit later on in his life. Ramm’s mother and father used to be apart of a traveling band of mercenaries, selling their services for money and fame. They got slowly but surely developed feelings for one another, married, and settled down in Menagerie, where they knew that their child and themselves would be accepted for who they were. When Ramm was little, the other children would make fun of him for having a beetle horn, calling him a dung beetle or bird food. Because of this, Ramm would often go off and explore the jungle close to their longhouse and observe all of the native fauna there, especially the bugs, as they were one of the few things he could relate himself too. During one of his outings however, the longhouse and the people living in it suffered an attack from the Grimm. Ramm was in the jungle exploring during this attack, and attracted the attention of a stray beringel. After an extensive chase, the beringel finally landed an indirect attack by smashing a rock, causing it to fragment into smaller pieces like a grenade. Ramm suffered a near fatal wound from the fragments as it split his chest open, and would've died if he wasn't saved by the older faunus warriors and brought back to the longhouse to be healed by a few of the caretakers there. After a few months of slow recovery, Ramm was back to his old ways, but he started to train in the forest, using his father's sword, as if his encounter with the Grimm had ignited a new flame within him. After a few years passed by, Ramm gave his friends and family a heart felt goodbye as he boarded a boat out of Menagerie to Mistral, where he would go to school at Sanctum to take his first steps in being a hunter. The faunus mostly kept to himself as he studied and trained, occasionally getting bullied by the students that thought they were cool, though Ramm would usually punch his way out of tough situations. This somewhat backfired on him though, as one day he was ganged up on by 8 students who had beef with him. The beetle boy was pushed to the ground and was punched, kicked, and spat on until he unlocked his semblance, pushing all of his assailants away into various walls and trashcans. Ramm limped away from the situation and was never bothered again. The years passed by as Ramm honed his skills at Sanctum, modifying his father's weapon and even making his own weapon. The faunus graduated from Sanctum and moved on to Haven, hoping to meet some friends and hone his skills even more. 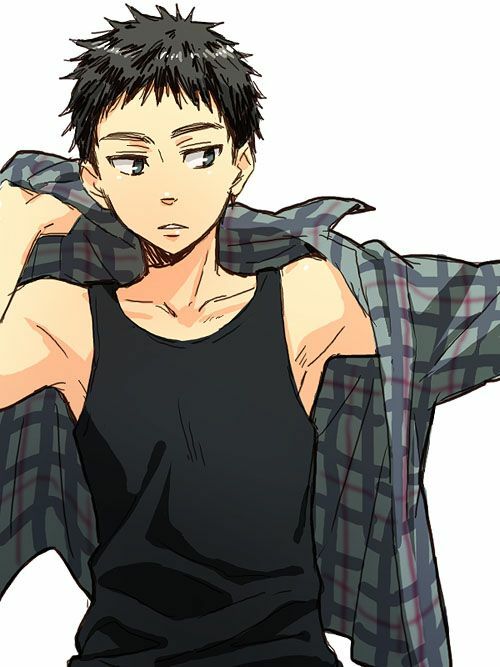 Personality: Ramm tends to be a laid back, if not quiet guy. He, along with many others, is a supporter for better faunus rights, which can cause him to suddenly speak up if a conversation reaches the topic. Ramm prefers to be alone and away from other people. It's not that he doesn't like talking to other people, as he can hold a conversation with someone for a while depending on the topic at hand. Ramm likes to be alone so that he can collect his own thoughts and think about himself instead of other people's ideas. Ramm is also laid back when it comes to school, only studying enough to the point where he can keep a B in the class. This is because Ramm sees combat as a more important occupation, rather than the study of swampland creatures and what not. Ramm's hobbies include listening to music, meditating, climbing, and fishing. Aura and Semblance: Aura Color: #974039 Aura Barrier -- Ramm creates a dome made of his own aura to protect himself and his allies. The diameter of this dome can change depending on how many allies Ramm needs to protect, ranging from 1 to 3 meters. He can deem whether or not someone is worthy to be let into the dome by letting the dome touch the person or things aura. Only beings with auras can be let into the bubble, so Grimm are automatically pushed away. Ramm is weak when in the dome, as he has pushed his own aura away from his body to make it. This leaves him vulnerable to deception, as anyone that he trusts--be them friend or foe--will always be let into the dome. Ramm can only keep the barrier up for 30 seconds, any longer than that and he'll start getting dizzy, get nosebleeds, and eventually pass out. The cooldown on this ability depends on how big the shield is, and long he kept it up for. On, average, it can last for 30 seconds to 2 minutes. Combat Behavior: Due to his semblance and main weapon, Ramm prefers to get into close quarters combat, as his semblance can push dangerous foes away before they get a chance to strike. Ramm's combat style can change depending on what type of dust he uses. For example, if he's using fire dust, he will charge in and try to slash his enemies up, making full use of the time that he has until the buff wears off. Ramm will also incorporate his gun into his combo's, causing enemies to, at the very least, be distracted from the powerful rounds coming their way. Ramm prefers to fight alone, as his protective instincts can cause him to use his semblance multiple times to protect his teammates, which in turn, can tire him out from it's repeated use. Ramm is also weak when fighting without dust or his bullets, as without them, he'll just be using a normal straight sword. Ramm also tends to worry too much about his surroundings, causing him to not give his all when fighting single opponents, as he is afraid of being ambushed. This fear does subside a bit when he's with his allies, but he will never fight at his true strength unless he's absolutely sure that all of the enemies have shown themselves. Ramm's own biology tends to be a weakness in battle, as his large horn can be easily targeted and shot or sliced off. Primary Form: A simple crimson straight sword that is 3 feet long and 3 inches wide. There is a revolver like cylinder near the hilt of sword that holds various types of dust capsules. These capsules are the size of pinky finger and are loaded into the cylinder by inserting them into the top hole when the blade is horizontal. Dust Functions: The sword’s cylinder can hold 6 types of dust at once. When a dust capsule is in use, it’s effect will travel through the blade. But, if the user wants to use another type of dust, they will have to wait until the current effect wears off. To change dust types, the user must press a button on the side of the hilt, and to use that dust, the user must pull a trigger located on the other side of the hilt. History: Ramm built this sword off of the one his late father had used in battle before he was born. Ramm modified it to use dust with the help of his professors at Sanctum. 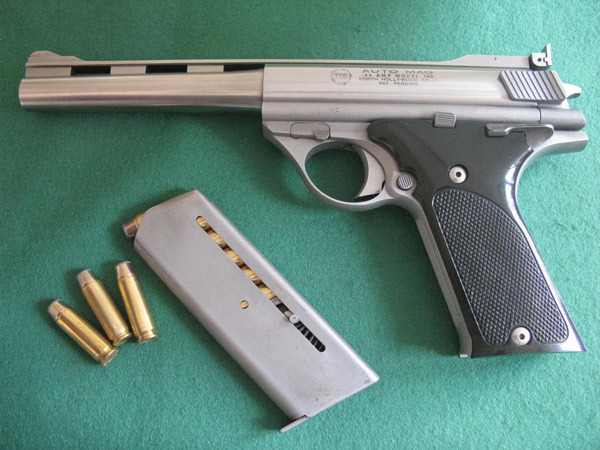 Primary Form: A simple, silver .44 Automag pistol with a 10 round magazine. It has the word "Avenger" engraved on the barrel in a fancy cursive font. History: Ramm built this simple firearm at Sanctum to help make up for his lack of ranged countermeasures. Aura and Semblance: Aura Color: #974039 Aura Barrier -- Ramm creates a bubble made of his own aura to protect himself and his allies. The diameter of this bubble can change depending on how many allies Ramm needs to protect, ranging from 1 to 3 meters. He can deem whether or not someone is worthy to be let into the bubble by letting the bubble touch the person or things aura. Only beings with auras can be let into the bubble, so Grimm are automatically pushed away. Ramm is weak when in the bubble, as he has pushed his own aura away from his body to make the bubble. This leaves him vulnerable to deception, as anyone that he trusts--be them friend or foe--will always be let into the bubble. Ramm can only keep the barrier up for 30 seconds, any longer than that and he'll start getting dizzy, get nosebleeds, and eventually pass out. The cooldown on this ability depends on how big the shield is, and long he kept it up for. On, average, it can last for 30 seconds to 2 minutes. Primary Form: A simple crimson straight sword that is 1’6” long and 6” wide. There is a revolver like cylinder near the hilt of sword that holds various types of dust capsules. These capsules are the size of pinky finger and are loaded into the cylinder by inserting them into the top hole when the blade is horizontal. History: Ramm built this sword off of the one his late father had used in battle before he was born. Ramm modified it to use dust with the help of his professors at Signal. History: Ramm built this simple firearm at Signal to help make up for his lack of ranged countermeasures. Alright, I guess I'm making one of these now even though I haven't even been on this site for that long but whatevs. This will be for me and any of my current characters, plus ones that could come up in the future. 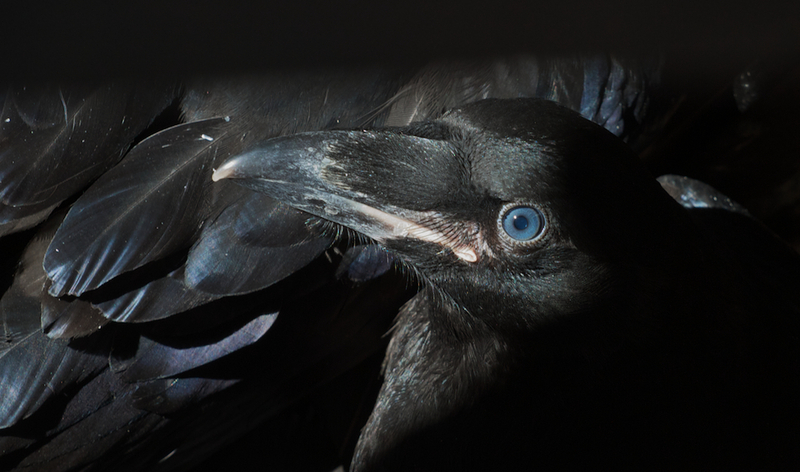 Symbol: A Raven with it's wings outstretched. Appearance: Mae stands at 5'2" and weighs a healthy 120 pounds, a good portion of which coming from muscle as she has a toned athletic build. She also has short black hair that extends a little bit past her ears. The Faunus has pale, freckled skin and has a modest bust and somewhat curvy hips. The first year, being a Faunus and all has various features to tell her apart from a crowd. Firstly would be that her pupils and iris' are enlarged and her sclera is black and her eye color (as well as her aura color) is this. Second would be the fact that the girl has multiple black feathers growing on her arms, from her shoulder down towards the wrist. Mae takes great pride in these feathers and keeps them well cleaned and groomed. When off duty/school, Mae wears a grey, long sleeve shirt, black jeans, and blue sneakers. 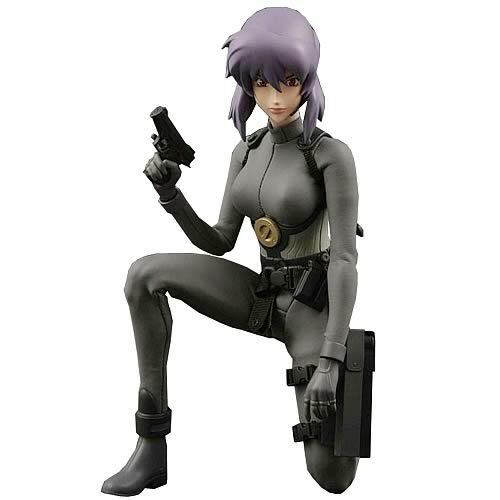 When she's on a mission, the girl will wear a black leather coat with her symbol engraved on the back over a grey and blue bodysuit which covers her from her neck to her feet (the bodysuit has built-in feet support). To cover her face, the first year wears a hooded mask stylized after a Nevermore, similar in look to masks White Fang officers would wear but, instead of red Grimm-like details, Mae stylized it to look more friendly and heroic, going for blue markings based off of ones her family would use to mark paths in their woodland territory. The Faunus also wears a black tactical belt and harness, on which she keeps 3 magazines of ammo for her crossbow rifle, one per each dust type, with the regular ammo already loaded into the weapon. She also keeps the contents of a basic first aid kit on her belt, harness, and jacket, just in case one of her allies or someone needs help. Mae was born to a human father and a Raven Faunus mother in a small cottage deep in the forest near Kuchinashi. Mae's mother worked as a huntress, taking job requests from the local town and protecting any merchants passing through. Mae's father worked as a trapper, and fur trader, selling what pelts he had skinned to the general store in town, while also keeping the meat he had acquired. On top of being rigorously taught the general education courses like math, English, and science by her mother, Mae was also taught how to hunt and defend herself from a very young age by her parents (mostly by her mom), who let her tag along when they were hunting smaller Ursas, Boarbatusks, and Beowolfs who had strayed too far from their pack, but still threatened their home. Mae's mother made frequent trips to town in search of textbooks and workbooks for the sake of Mae's education. Mae loved reading and writing, as it gave her something else to besides go out with her parents or garden, and would study for hours on end every day. Around the time Mae built her weapon--albeit a very rudimentary prototype version of it--her parents let her go out hunting for small animals and Grimm. She would spend hours wandering the forest and admiring the beauty of nature, although she would tend to get lost and into trouble while doing this. As time went on in the forest, the young Raven Faunus got older and was helping her father hunt on a regular basis for big game, and big Grimm. Mae's mother continued to go on missions for the local town, but because of her age, she couldn't complete as many contracts as she used to. To offset this, Mae decided to look for a job as an assistant to a blacksmith, thinking the experience would help become a better weapon designer. When she looked at the board, there were no openings for such a position, but she did find an offering for an engineer's assistant. Desperate for work, she walked to the engineer's house to check in as their new assistant. When she knocked on the door, she expected a stereotypical old, and cranky man. She was surprised to see a middle-aged man--somewhere in his forties--open the door. He wore very casual attire, like glasses, a button-up shirt, pants, and sandals. He was kind and welcoming, if not a little snobbish. He introduced himself as Bashir Cooper, an Atlas engineer who wanted a quiet life near the great rural areas of Mistral. Bashir wanted to pursue his dream of being a custom weapon designer, and to do that, he needed someone to help him test his new inventions--which of course were prototypes and very unstable, possibly life-threatening. Mae agreed to test the weapons, but only on the sole condition that Bashir would help her on her journey towards being a huntress, whether that be helping her study or helping her make weapons and gear. Of course, Mae never told her parents about testing life-threating inventions. Once Mae had turned 18, her parents were a little shocked to find out that she wanted to go Beacon Academy, as Mae's mother and other relatives had all gone to Haven. Mae explained to her parents that she wanted a change of scenery from the wide expanses of the forest, and wanted to experience what Vale had to offer. After a few days of consideration, Mae's mother gave her full support to her daughter's success. With the admission date a couple of months away, Mae trained and studied with her mother and Bashir more so than ever before. When Mae's mother was on a mission, Mae would go over to Bashir's workshop to study and test weapons. When the day came to apply to Beacon, Mae passed all of the admission tests with little difficulty, scoring relatively high considering her home-schooled education. She was scheduled to leave Mistral in two weeks, and in that time, she said her goodbyes to her old friends who were going to attend Haven Academy. Before boarding the airship, Mae said her goodbyes to her parents, who promised that Mae would always have a home in Mistral. Bashir gave an almost tearful goodbye and offered to send her some custom equipment if she ever needed it. She thanked him and her parents for everything before she boarded the airship to Beacon. Personality: Despite her lack of formal education, Mae loves it when someone other than her parents can teach her about something other than hunting. She works very hard when it comes to schoolwork, studying and reading whenever she isn't hanging out with friends or on a mission. Mae doesn't tend to talk a lot, even when she's with friends and professors, nodding and shaking her head in place of words. The girl isn't exactly anti-social, she just doesn't have a lot to say most of the time. This can lead to Mae's friends taking the girl's words as well founded if she ever has to speak. Being a Faunus herself, Mae is a huge advocate of Faunus rights, sometimes going to non-violent protests. She even considered joining The White Fang at a young age, which resulted in her getting scolded by her mother. Despite being quiet, Mae is very kind and compassionate, not just to allies, but to enemies as well, performing first aid on those who need it. Mae's hobbies include taking hikes through the forest, reading, gardening, and cooking. Semblance: Stealth Feathers -- The Raven Faunus can create feathers out of aura, a total of six. These feathers help Mae sneak around, each one suppressing her personal sound, with all six muting any sound she could make, a reload or her feet crushing some dried leaves making no sound at all. The first year can give other people feathers as well, usually placing them on a person or throwing them like darts into people's clothing. By giving others feathers, it will help suppress their sound at the cost of Mae's. Combat Behavior: Due to the nature of her weapon and semblance, Mae likes to use her heightened Faunus agility to stay in the shadows and harass her enemies from afar with her variety of crossbow bolts. If the enemy gets too close, however, Mae will use her claws to defend herself--albeit, not very effective due to her low physical strength--until her allies arrive to give her back up. If Mae sees an ally in danger, she will advance towards them while putting suppressing fire on the enemy they are fighting. Because of her blind, caring behavior, she can leave herself wide open without even noticing it. Mae is especially vulnerable after using her semblance for a long time, as she will be incredibly exhausted. Mae will often focus in on one target and forget that there are other enemies around her, which usually leads to her being caught off guard, even when she could've prevented it. Primary Form: A blue and silver orange semi-automatic sniper rifle that shoots crossbow bolts. It has a hybrid scope, allowing the user to engage targets at medium to long range without a huge loss in accuracy. The magazine is a long and rectangular with a slit at the bottom for the bolts to go through. Each magazine holds 15 bolts--which can be coated with different kinds of dust for any situation. Dust Functions: The crossbow bolts can be coated with dust to add a little extra punch to the weapon. Mae carries around 3 dust coated bolt canisters. The main elements she uses are Ice (to slow down attackers that get too close), Fire (to shred lightly armored targets), and Lightning (to hurt opponents using metal armor or robots). 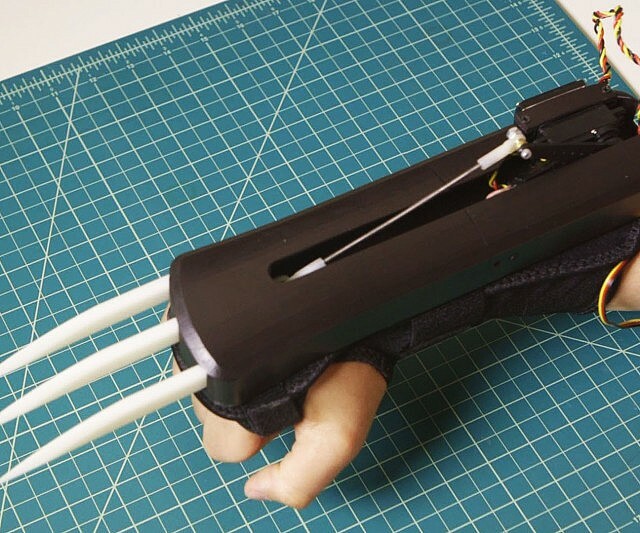 Primary Form: A pair of gauntlets, each containing three six-inch blades. The blades are retractable and only come out when Mae makes a specific motion with her fingers. These are usually used when Mae needs to engage someone in melee combat. History: With the help of Bashir, Mae created a pair of clawed gauntlets to help her in melee combat. Ok, second character! I don't have that much time to write this so it's gonna be kind of bare bones. Sorry about that! Appearance: (Little bare bones, sorry) Mae stands at 5'2", weighs 120 lbs., and has a toned, athletic build. She has short black hair which she keeps away from her forehead. She does this to make room for a few dark orange feathers that grow straight up from the rim of her forehead. Her pupils and iris' in her eyes are enlarged and her sclera is black and her eye color is orange gold. Her eyes of that of a hawk, so naturally she can see things clearly from over a mile away. She has paleish, freckled skin. She also has a modest bust and somewhat curvy hips. When off duty/school, Mae wears a grey, long sleeve shirt, black jeans, and orange sneakers. When she's on a mission, Mae wears a light brown leather coat with wings engraved on the back over a white and dark orange body suit which covers her from her neck to her feet (the body suit has built in feet support). Mae also wears a black utility belt, on which she keeps 3 magazines of ammo for her weapon, and some light provisions and aid. Mae was born to a human father and a Faunus mother (who is also a hawk Faunus) in a small cottage deep in the forest near Kuchinashi. Mae's mother worked as a huntress, taking job requests from the local town and protecting any merchants passing through. Mae's father worked as a trapper, and fur trader, selling what pelts he had skinned to the general store in town, while also keeping the meat he had acquired. Mae--who was home schooled for most of her life--was taught how to hunt and defend herself from a very young age by her mother and father, who let her tag along when they were hunting smaller Ursas, Boarbatusks, and Beowolfs who had strayed too far from their pack. Around the time Mae built her weapon--albeit a prototype version of it--her parents let her go out hunting for small animals and Grimm. She would spend hours wandering the forest and admiring the beauty of nature, although she would tend to get lost and into trouble while doing this. Time went on in the forest. Mae got older and was helping her father hunt on a regular basis for big game, and big Grimm. Mae's mother continued to go on missions for the local town, but because of her age, she couldn't complete as many contracts as she used to. To offset this, Mae decided to look for a job as an assistant to a blacksmith. When she looked at the board, there were no openings for such a position, but she did find an offering for an engineer's assistant. Desperate for work, she walked to the engineer's house to check in as their new assistant. When she knocked on the door, she expected an old, cranky old man. She was surprised to see a middle aged man--somewhere in his forties--open the door. He wore glasses, a button-up shirt, pants, and sandals. He was kind and welcoming, if not a little snobbish. He introduced himself as Bashir Cooper, a retired Atlas engineer that wanted a quiet life near the great rural areas of Mistral. Bashir wanted to pursue his dream of being a custom weapon designer, and to do that, he needed someone to help him test his new inventions--which of course were prototypes and very unstable, possibly life threatening. Mae agreed to test the weapons, but only on the sole condition that Bashir would help gear her up for her journey towards being a huntress. Once Mae turned 18 and became eligible to attend a Huntsman Academy, it became apparent that her lack of formal education or combat training would severely hinder her chances of getting into her dream school of Beacon Academy. Realizing this, Mae signed up for a continuation program at Haven Academy and stayed there for a year honing her latent intellect and combat prowess. The curriculum was accelerated and the training was body numbing, but Mae managed to make it through the school year in a great state of both body, and mind. When Mae came home, she turned her walks/hunts in the forest into to full-on exercise sessions, jumping from tree to tree, and hunting prey that grazed many miles away from her home. When Mae wasn't training, she was studying at Bashir's workshop in the village and testing new weapons and equipment. When the time came to apply for Beacon, Mae was accepted right away, and within 3 months was saying goodbye to her family, friends, and Bashir--who she hugged a lot longer than anybody there--and boarded an airship to Beacon. by being kind and compassionate, but by also scolding and encouraging them. Mae's hobbies include taking hikes through the forest, reading, gardening, and cooking. Semblance: Healing Fire -- Mae can heal herself or others by using flames/fire/heat which she can generate herself, or by using an object that gives off heat/is lit by fire (i.e. candles, tungsten light bulbs, electric lanterns, lighters, etc.). The fire that Mae can produce is comparable to that of a very small fireplace and is made from her own aura, however, she can only produce this heat for 4 minutes straight--without interruption--before she starts getting dizzy. Within that 4 minute time frame, Mae can heal a few broken bones with her own heat. If Mae uses an heat generating object, her aura isn't drained as fast, but the healing process is significantly slower than if she were using her own flame. Mae will only use a heat generating object during combat to heal light wounds (small cuts, bruises, etc). Mae cannot use her fire offensively, nor can she manipulate fire to attack enemies. 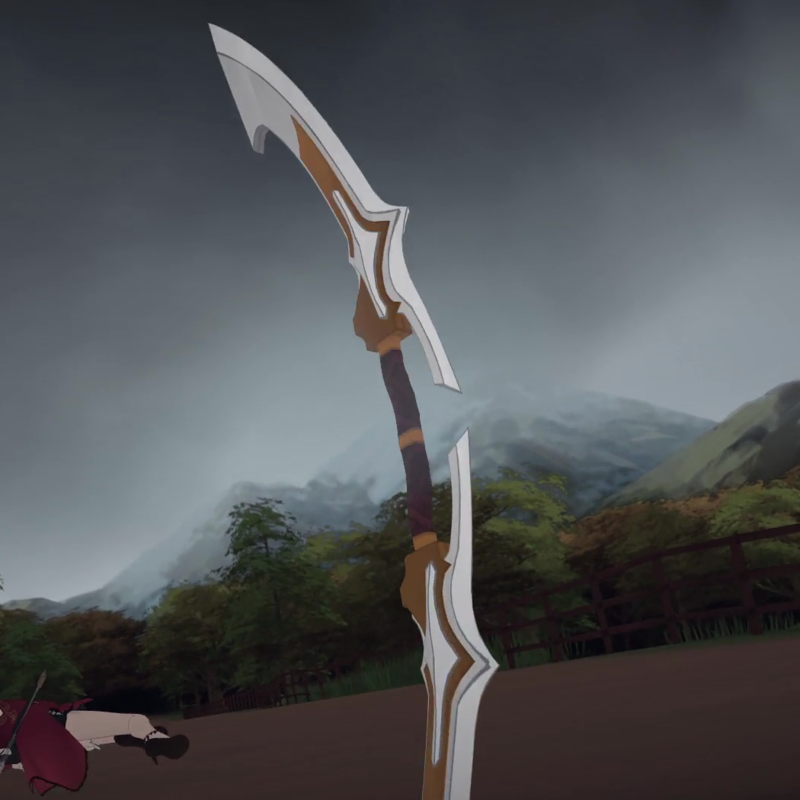 Combat Behavior: Due to the nature of her weapon, Mae likes to use her heightened Faunus agility to stay in the shadows and harass her enemies from afar with her variety of crossbow bolts. If the enemy gets too close, however, Mae will use her hunting knife to defend herself--albeit, not very effectively due to her low physical strength--until her allies arrive to give her back up. If Mae sees an ally in danger, she will advance towards them while putting suppressing fire on the enemy they are fighting. Because of her blind, caring behavior, she can leave herself wide open without even noticing it. Mae is especially vulnerable after healing a teammate, as it takes a lot out of her just to heal one substantial wound. Mae will often focus in on one target and forget that there are other enemies around her, which usually leads to her being caught off guard, even when she could've prevented it. 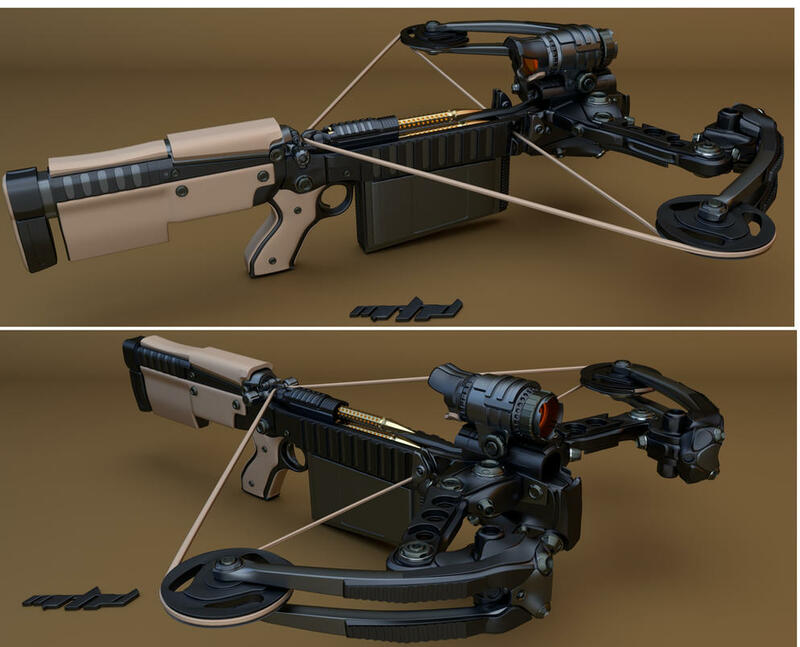 Primary Form: A black and golden orange semi-automatic crossbow with a hybrid scope, allowing the user to engage targets at medium to long range without a huge loss in accuracy. The magazine is a cylinder with a slit at the top for the bolts to go through. Each canister holds 25 bolts--which can be coated with different kinds of dust for any situation. 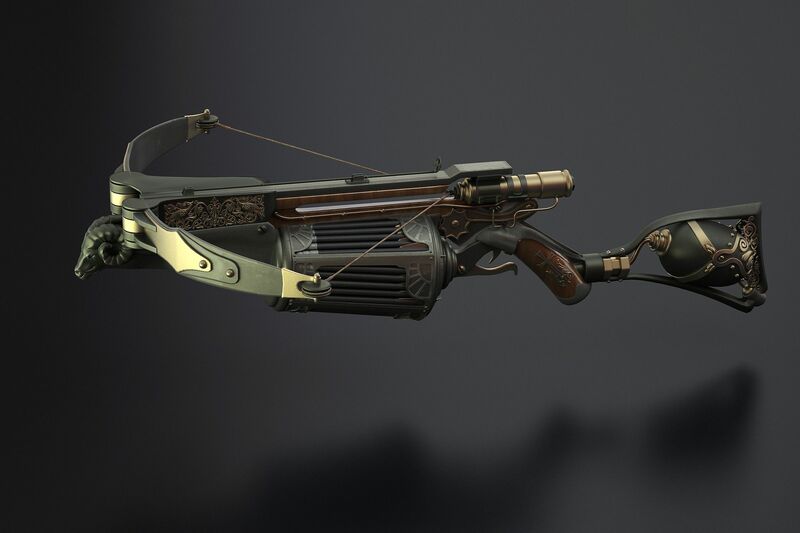 Dust Functions: The crossbow bolts can be coated with dust to add a little extra punch to the weapon. Mae carries around 3 dust coated bolt canisters. 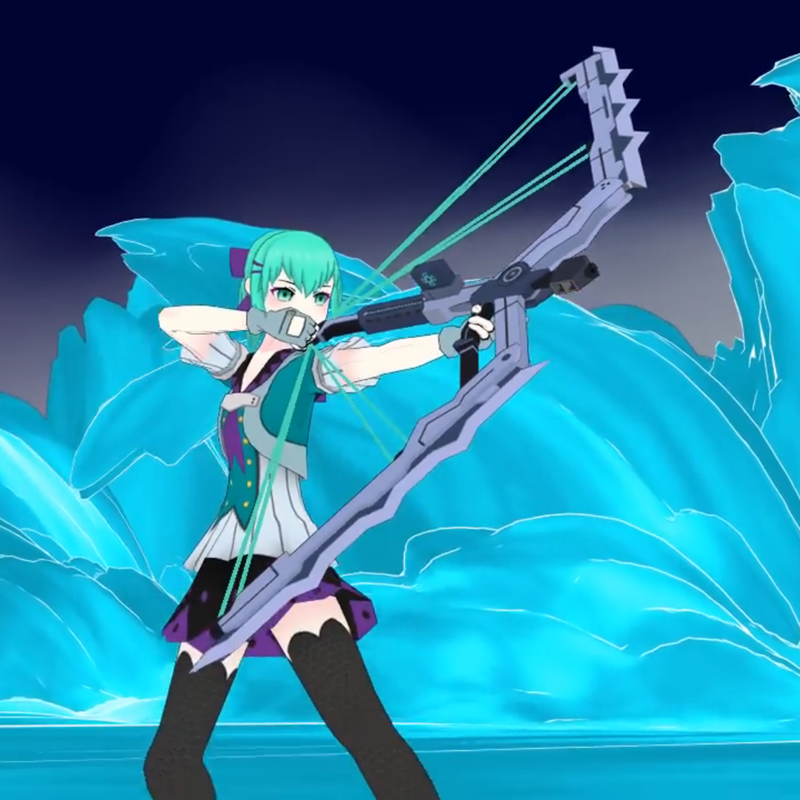 The main elements she uses are Ice (to slow down attackers that get too close), Fire (to shred lightly targets), and Lightning (to hurt opponents using metal armor). History: When Mae was allowed to hunt, her parents helped her create a somewhat rudimentary crossbow. Mae would continue to find ways to upgrade this crossbow with the help of Bashir before going to Beacon. 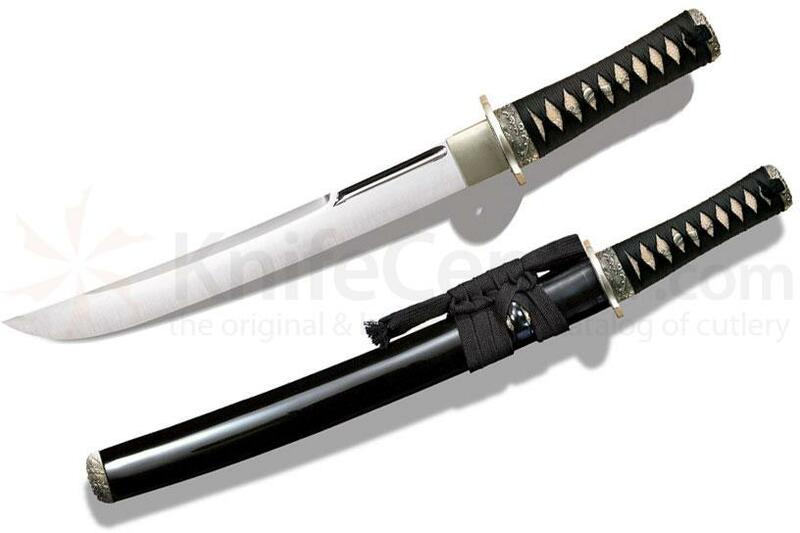 Primary Form: A tanto with a silver blade and an orange and white hilt. History: With the help of Bashir, Mae created a small hunting blade that could easily skin the pelt off any animal, much less a human. Symbol: A human skull with a metal jaw and a robotic eye. Appearance: Acero, or Ace as the ones close to him like to call him, stands at 5'9" with a healthy weight of about 175 pounds, most of which coming from muscle, as he has a toned, athletic build. He has short black hair and solid eyebrows, though there are some separation lines due to scaring. His eyes are a navy blue, and smaller than average. Due to a recent accident that occurred during a training session between students, Acero's body has suffered some disfigurements. He now has several severe burn marks that cover most of the left side of his body. Due to the accident, and an incident prior to it, the 4th year has needed to be fitted with a prosthetic left arm, left leg, left hip, left eye, and jaw. His casual apparel consists of a white t-shirt, a black snapback hat, black baggy sweatpants, and red/black tennis shoes. When he goes into combat, Acero will wear an almost entirely black uniform with crimson highlights and white armor plates. The uniform includes military-style overalls laced with some kevlar, a trenchcoat, combat boots, light metal plates to protect the chest, back, elbows, and hips. The final piece of the uniform comes in the shape of a combat helmet that protects the entire head, with a black, bulletproof visor letting the user see through it. The helmet follows the color scheme of the rest of the uniform and comes up with a basic heads-up display that shows aura and ammunition levels, a built-in communications radio that can be tuned to different frequencies, and a forehead-mounted flashlight. There are a few small pouches and a couple of flashbang holders on the chest plate, letting Acero bring ammo and carry and other small items he may need. Previously, Acero used to have an arm-mounted laser pistol to engage enemies, he has since removed this after reforging his weapon to include a ranged component. Acero was born and raised in the kingdom of Atlas. For most of his life, he lived a quiet, albeit dull life. Ever since he was young, he would go to school, train, go home, rest, and repeat. His parents weren’t home very much due to them being on various archaeological trips, so the only people he could talk to were his older, very talkative sister, Talim, and their Faunus babysitter, Juno. Juno was a retired huntress that had come to know the Walkers by escorting them through various Grimm infested areas and ruins. She was a wolf Faunus that cared deeply for Faunus rights and was even a White Fang member when it first formed--she left when it started getting violent. Talim--who was 2 years older than Acero--talked about any topic she could think of whenever she could find an opportunity to, and Juno and Acero listened intently but didn’t talk unless Talim stopped to catch her breath. Acero and Talim treated Juno with great respect and grew up with hatred for those who take advantage of Faunus, even starting fights because of it. This behavior carried on until they got severely punished by their parents and teachers. Acero had never done anything notable in his life--except beating up Faunus haters--until he got to Atlas Academy. He spent three years there, being trained and taught by both his professors and Juno. Acero found his weapon, Solar Centurion, his second year and started to unlock his semblance at the same time. Acero worked for a postal service when he wasn’t in school and started to save up money when he could, as he wanted to move to Beacon to avoid going into the military. Talim didn’t like his decision, but respected it, as she knew that the military wasn’t for everyone. One day during his third year, Acero’s parents never came home weeks after their supposed arrival date. They were later found buried in the snow, 10 miles away from their dig site, along with the hunter that was protecting them. Their bodies had been torn apart by the Grimm, with the only discernible features being their clothing and their faces. Acero and Talim mourned the deaths of their parents. Juno also mourned their deaths and helped the two siblings bury their parents. The three found the dead couple’s will and inheritance letter hidden in the house. The letter stated that Acero and Talim would split their fortune, and Juno would keep their house and its belongings, along with any artifacts that the Walkers found and kept on their journies. These included various weapons, armors, and valuable trinkets. Juno sold most of it to a museum, which allowed her to live the rest of her life in peace. Talim took two unique talwar swords with her as she left for the military. Acero went back to school pretty depressed, and anything his former team did to cheer him up failed. Before he left for Vale, Acero asked his team if they could hunt the Grimm that killed his parents. They agreed and made a two-day journey to the dig site. The Grimm ended up overwhelming the 3rd years and they were all badly injured, Acero being in the worst condition due to fending off a horde of Grimm to save his friends. Acero woke up a week later and was in a hospital. He couldn’t feel his left arm or see out of his left eye, but there was a feeling of cold metal touching his neck and upper jaw. His lower jaw left eye, and arm couldn't have been saved and was amputated as a result. Talim and Juno were crying as he looked at his new appearance, but Acero said nothing and looked at his remaining arm with a sense of determination. He looked at his caretakers and yelled at them to shut up and stop crying. This made the crying worse and he sighed deeply. The doctor came in and asked Acero if he would be interested in prosthetic replacement parts. Acero nodded and signed off on the paperwork. Juno would pay for these new limbs and the surgery about a month later. After about 2 weeks of recovery, Acero came back and finished his third year at Atlas. A week after school ended, Acero said goodbye to his friends and family as he left for Beacon Academy. Recently, Acero was almost killed during a sparring match, due to a stray bullet hitting a bag of explosives that he was holding. He was rushed to the hospital and stabilized, staying unconscious for a few days as they treated the burn marks. 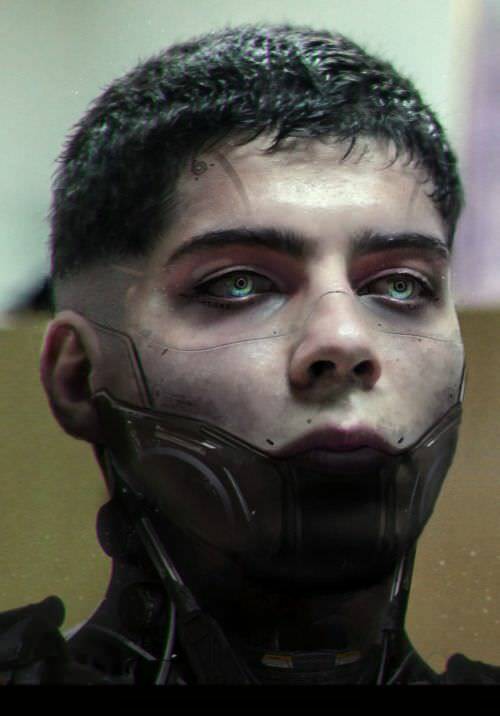 When he awoke, Acero found himself in a similar, yet worse situation than before, parts of himself missing, scars all over his body. His sister and godmother came to visit him at Beacon hospital for a few days, crying over his newly disfigured state. After they left, Acero was visited by an official from Atlas. The official offered Acero new limbs and equipment, with a few strings attached of course. An easy option that the official gave was to sell out the schools plans for the Vytal Festival. The harder option was to do some paid, unaffiliated work for Atlas when he graduated, at least until the prosthetic's and new gear were paid off. Not wanting to sell out his new school and friends, Acero decided to take the harder option, and come work for Atlas when he graduated. Personality: Despite the hardships he experienced, Acero is a very laid-back--albeit lazy--and caring person. He's not really one for school (he never tries hard in any of his classes, he just learns what he can and sticks with it, although he does study when he needs to pass a class) or conversation, but when he's with his team, he opens up and gives orders freely and confidently, something his team appreciates, but also gets fed up with from time to time. Ever since sparring accident, Acero has been proactive in studying for his classes and training for combat, knowing that he'd need to smarten and train up to repay his debt to Atlas. He does tend to keep silent unless spoken to, but even then he keeps his sentences relatively short unless the answer is complex. His hobbies include playing video games, listening to music, photography, boxing, and weightlifting. Semblance: Flowmotion -- Acero can fluidly move around on both land and air. This allows him to perform feats such as kicking off almost any surface, air dash, swinging around lampposts, grinding along rails, and battling enemies with speed and style. Basically using his environment to his advantage. Acero doesn’t move super fast, but he can keep up with speedier opponents (not Tyrian or Qrow kind of speed mind you) and outspeed and outmaneuver slower opponents. Acero can only air dash/wall jump a total of 8 times before needing to rest a bit. Acero can only use his semblance when the terrain calls for it, meaning if he’s in an open field or desert, he loses a little maneuverability due to the loss of wall running/jumping and can get overpowered by fast opponents due to his semblance excelling in tight places. It also takes a lot of accuracy and energy to pull off very complex maneuvers in a battle, which means if he messes up just a little, it could cost him. Due to having years of practice, he doesn’t have to worry about his accuracy or energy too much, but the threat of messing up or running out of steam is still constant while he fights. If Acero goes 100%, he can fight for about 6 minutes. If he goes 75%, he can fight for about 8 minutes and so on. Combat Behavior: Due to the nature of his semblance, Acero favors a hit and run fighting style, using the environment and his to outmaneuver his foes. He tries his best to mix all of his weapon transformations into his fighting style, blocking with one before attacking with another. This makes him a formidable foe to both groups and individuals, as it is hard to predict what form he'll use if you fight him for the first time. Acero also fights with a sense of chivalry and honor--asking for his foe's name, and even bowing to them in respect. Acero is always cautious when fighting an enemy, in fear that he might be ambushed. This causes him to only give 75% of his max power when fighting, as he is afraid that someone else might appear. If this does happen, the cyborg will either retreat to a place where he can fight better, or he will go all out in an attempt to defeat his previous foe so that he can focus on the new one. The 4th year has recently reforged his weapon to include a rifle-caliber ranged component, giving him even more versatility in battle at the cost of letting the sword transform into its greatsword form. Despite this, Acero still favors melee combat, with the ranged part of his weapon being used against targets that are far away or to thin a herd of weaker Grimm. Primary Form: Bow Form - After having his weapon reforged to include a ranged weapon and stronger composition, Acero can now effectively fight enemies at ranged combat. Despite this, the cyborg still prefers to fight with the melee modes of his weapon. Instead of arrows, this bow fires off 7.62x50mm rounds (which are loaded into the side of the firing mechanism) with little recoil. However, this is not a quiet weapon by any means, so Acero will need to rely on the melee forms of his weapon to silently take down enemies. While the rifle caliber and magazine system would be perfect for dust ammo, the 4th year prefers not to use it, remembering why he got his leg blown off in the first place. 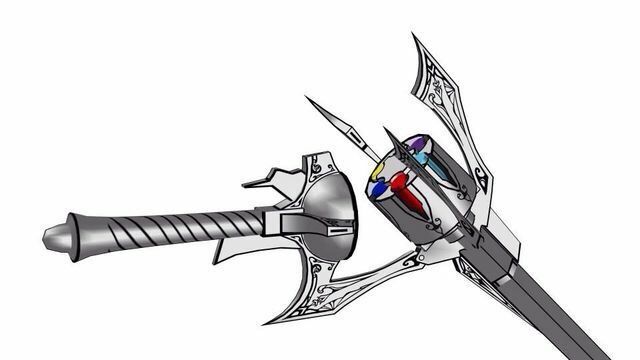 Secondary Form: Dual Swords Form - After pressing the button near the trigger mechanism, the bow will retract the firing mechanisms and form two curved blades, formed in the style of the past version of the weapon. This form doesn't hit as hard as the greatsword from the old weapon, but they are quicker, allowing the user to keep up with faster foes. There is a magnetic locking mechanism on the bottom of the hilt of each sword that lets them link up to each other to form a Polearm. Tertiary Form: Polearm Form - This form allows the user to clear waves of weak enemies and can also be used to deflect bullets and projectiles of reasonable size i.e. arrows, small to medium sized rocks, etc. History: Before, Acero only had a basic sword and shield when he attended Atlas Academy. Acero’s parents refused to pay outrageous prices for Atlas sanctioned weaponry, so they gave Acero his great grandfather's sword and shield and promised him that they would get him better equipment, but never did. While on a class field trip to some Grimm infested ruins in the snowy Solitas mountains, Acero found the weapon that would later be named Solar Centurion in an old, yet untouched tomb. The tomb was guarded by several Ursas’ and Geists--who possessed suits of armor to attack. Acero managed to overpower them with his semblance--which at this time hadn’t fully developed yet because it was his 2nd year. With all of the enemies defeated, Acero picked up the weapon and felt an unfamiliar, yet kind warmth fill him as if the weapon was congratulating him on his victory. Acero gave his hand me downs back to his parents and kept his new partner close to him at all times. He named it Solar Centurion the day after he got back from the field trip and has proudly wielded it since then. However, as of late, the cyborg has found himself in many situations where having a ranged component stronger than his wrist laser would be preferred. With a heavy heart, Acero had his weapon reforged by the best and most reasonable blacksmith he could find, who would later call the reforged weapon their best work after giving it back to the 4th year. A stronger, more versatile, and more intuitive weapon, Acero picked up Wrathful Centurion easily, though the bow portion of the weapon made the cyborg take a quick archery class to learn the best techniques on using that mode. This is kind of WIP because I don't have any visual representation or solid back story for most of my characters because I usually don't do fan-fic. Hopefully I can have someone draw my OCs for me in the near future (I'm a bad artist) because I really want to see them for real instead of just in my head. If you have any problems/critiques with my character, please tell me so that I can make it better! Anyway, lets jump right in to my first character, who I somewhat based off myself. Appearance: (This is gonna be kind of bare-bones) 5'9" and average toned build. 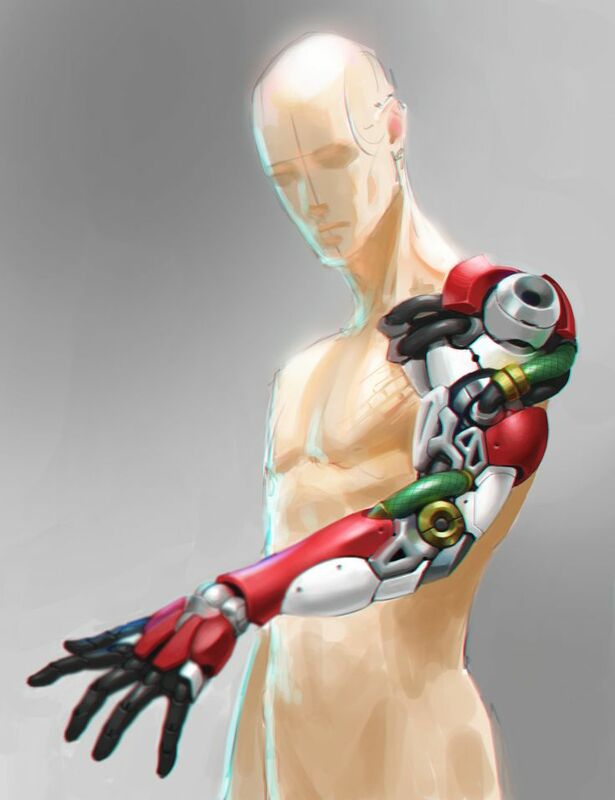 Has a cybernetic left eye and arm due to the actual ones being cut out/off by a White Fang member. 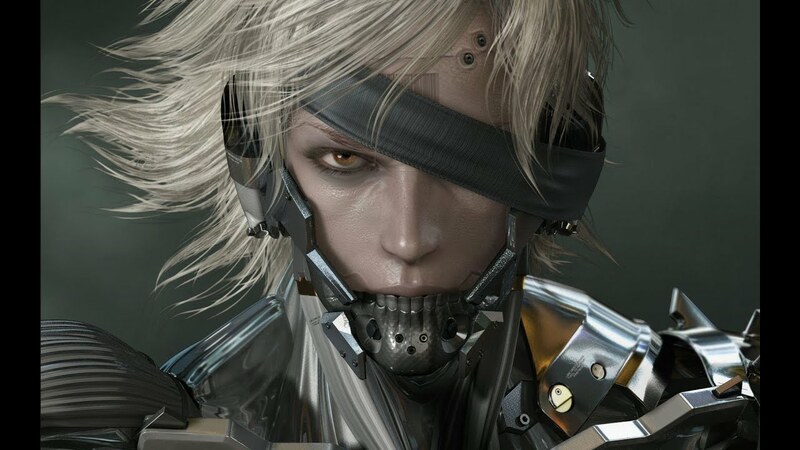 He also has a cybernetic lower jaw (similar to Raiden from MGSRR). He has multiple scars, including a Zuko like burn mark on the left side of his face. His hair is black and short. His eyes are red, and smaller than average and his eyebrows are solid, but separate at the ends farthest from the middle. When not in uniform, he wears a red T-Shirt that has a giant peace sign on the front, somewhat baggy black and white sweatpants, and red and grey shoes. 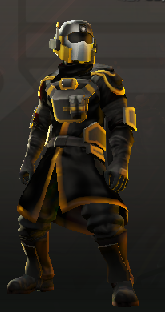 When being deployed on a mission, he puts white and gold plating over his casual clothes (original I know). Acero was born and raised in the kingdom of Atlas. For most of his life, he lived a quiet, albeit dull life. Ever since he was young, he would go to school, train, go home, rest, and repeat. His parents weren’t home very much due to them being on various archeological trips, so the only people he could talk to were his older, very talkative sister, Talim, and their Faunus babysitter, Juno. Juno was a retired huntress that had come to know the Walkers by escorting them through various Grimm infested areas and ruins. She was a wolf Faunus that cared deeply for Faunus rights and was even a White Fang member when it first formed--she left when it started getting violent. Talim--who was 2 years older than Acero--talked about any topic she could think of whenever she could find an opportunity to, and Juno and Acero listened intently, but didn’t talk unless Talim stopped to catch her breath. Acero and Talim treated Juno with great respect and grew up with hatred for those who take advantage of Faunus, even starting fights because of it. This behaviour carried on until they got severely punished by their parents and teachers. Acero had never done anything notable in his life--except beating up Faunus haters--until he got to Atlas Academy. He spent three years there, being trained and taught by both his professors and Juno. Acero found his weapon, Solar Centurion, his second year and started to unlock his semblance at the same time. Acero worked for a postal service when he wasn’t in school and started to save up money when he could, as he wanted to move to Beacon to avoid going into the military. Talim didn’t like his decision, but respected it, as she knew that the military wasn’t for everyone. One day during his third year, Acero’s parents never came home weeks after their supposed arrival date. They were later found buried in the snow, 10 miles away from their dig site, along with the hunter that was protecting them. Their bodies had been torn apart by the Grimm, with the only discernible features being their clothing and their faces. Acero and Talim mourned the deaths of their parents. Juno also mourned their deaths, and helped the two siblings bury their parents. The three found the dead couple’s will and inheritance letter hidden in the house. The letter stated that Acero and Talim would split their fortune, and Juno would keep their house and its belongings, along with any artifacts that the Walkers found and kept on their journey. These included various weapons and armors imbued with special properties. Juno sold most of it to a museum, which allowed her to live the rest of her life in peace. Talim took two unique dust infused talwar swords with her as she left for the military. Acero went back to school pretty depressed, and anything his former team did to cheer him up failed. Before he left for Vale, Acero asked his team if they could hunt the Grimm that killed his parents. They agreed and made a 2 day journey to the dig site. The Grimm ended up overwhelming the 3rd years and they were all badly injured, Acero being in the worst condition due to fighting a dragon Grimm. Acero woke up a week later and was in a hospital. He couldn’t feel his left arm or see out of his left eye, but there was a feeling of cold metal touching his neck and upper jaw. His lower jaw, left eye and arm couldn't have been saved and were amputated as a result. Talim and Juno were crying as he looked at his new appearance, but Acero said nothing and looked at his remaining arm with a sense of determination. He looked at his caretakers and yelled at them to shut up and stop crying. This made the crying worse and he sighed deeply. The doctor came in and asked Acero if he would interested in prosthetic replacement parts. Acero nodded and signed off on the paperwork. Juno would would pay for these new limbs and the surgery about a month later. After about 2 weeks of recovery, Acero came back and finished his third year at Atlas. A week after school ended, Acero said goodbye to his friends and family as he left for Beacon Academy. Personality: Despite the hardships he experienced, Acero is a very laid-back and caring person. He's not really one for school or conversation, but when he's with his team, he opens up and gives orders freely and confidently, something his team appreciates, but also gets fed up with from time to time. His hobbies include playing video games, listening to music, photography, boxing, and weightlifting. Semblance: Flowmotion -- Acero can fluidly move around on both land and air. This allows him to perform feats such as kicking off almost any surface, air dash, swinging around lampposts, grinding along rails, and battling enemies with speed and style. Basically using his environment to his advantage. Acero doesn’t move super fast, but he can keep up with speedier opponents (not Tyrian or Qrow kind of speed mind you) and outspeed and outmaneuver slower opponents. Acero can only use his semblance when the terrain calls for it, meaning if he’s in an open field or desert, he loses a little maneuverability due to the loss of wall running/jumping, and can get overpowered by fast opponents due to his semblance excelling in tight places. It also takes a lot of accuracy and energy to pull off very complex maneuvers in a battle, which means if he messes up just a little, it could cost him. Due to having years of practice, he doesn’t have to worry about his accuracy or energy too much, but the threat of messing up or running out of steam is still constant while he fights. If Acero goes 100%, he can fight for about 6 minutes. If he goes 75%, he can fight for about 8 minutes and so on. 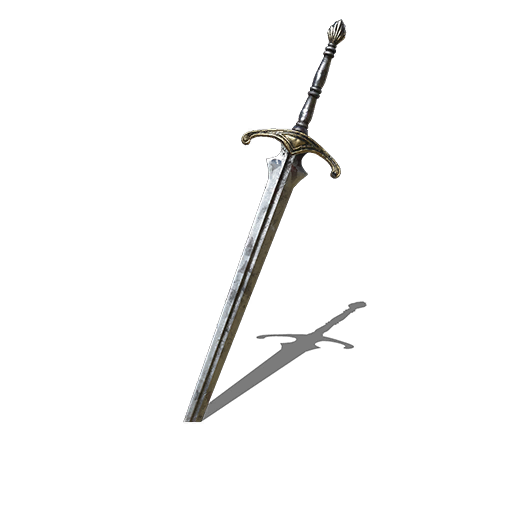 Primary Form: Greatsword Form - The basic form of the weapon, there are two holes in the sword near the top and bottom. There's a button on the hilt that allows it to split in half into its quicker form. The sword is orange and red. Secondary Form: Dual Swords Form - After pressing the button on the hilt, the sword can be split in half. This form doesn't hit as hard as the greatsword, but they quicken the users attacks, allowing him to keep up with fast foes. There is a mechanism on the bottom of each swords hilt that lets them link up to each other to form a Polearm. Tertiary Form: Polearm Form - This form allows the user to clear waves of weak enemies and can also be used to deflect bullets and other projectiles of reasonable size i.e. arrows, small to medium sized rocks, etc. History: Before, Acero only had a basic sword and shield when he attended Atlas Academy. Acero’s parents refused to pay outrageous prices for Atlas sanctioned weaponry, so they gave Acero his great grandfather's sword and shield and promised him that they would get him better equipment, but never did. While on a class field trip to some grimm infested ruins in the snowy Solitas mountains, Acero found the weapon that would later be named Solar Centurion in an old, yet untouched tomb. The tomb was guarded by several Ursas’ and Geists--who possessed suits of armor to attack. Acero managed to overpower them with his semblance--which at this time hadn’t fully developed yet because it was his 2nd year. With all of the enemies defeated, Acero picked up the weapon and felt an unfamiliar, yet kind warmth fill him, as if the weapon was congratulating him on his victory. Acero gave his handme downs back to his parents and kept his new partner close to him at all times. He named it Solar Centurion the day after he got back from the field trip and has proudly wielded it since then.